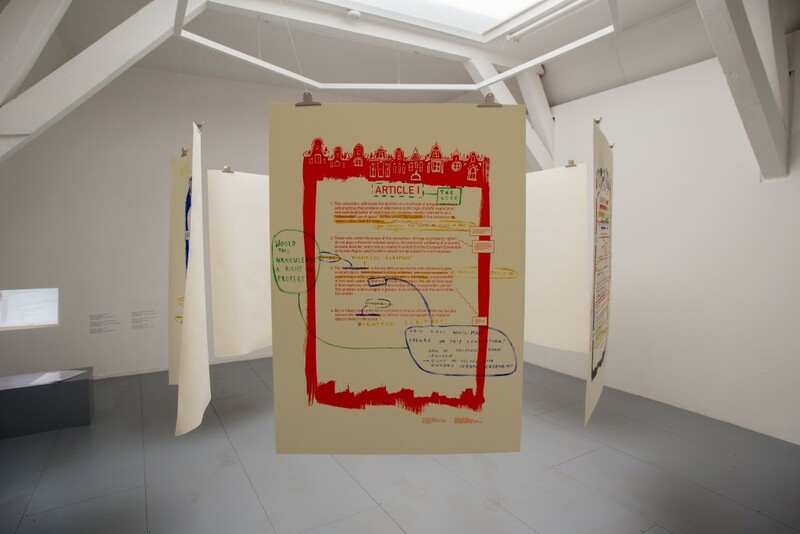 As part of the program 'Broadcasting the Archive' curated by Gemma Medina and Alessandra Saviotti at mima, Middlesbrough (25-28 October 2016), Adelita Husni-Bey was invited to answer some questions related to the 'Convention on the Use of Space'. Could you please explain your project? The ‘Convention on the Use of Space’ is a legal document, in the sense that it borrows legal language and in the sense that it wants to be a contract between the entities that write it and everybody who sings it. Yet the Convention in itself is not actually a legal document because it is not recognized by any state, therefore it has been referred to in the past as a ‘para-legal’ document, which means that it is trying to create its own sense or form of legality through making a claim that is currently illegal. In its current form, the Convention is basically a collection of articles; this collection of articles speaks to the idea that occupation should be re-legalized, or made legal, or protected, depending on the country where the Convention has been taken to (and re-written in), and that urban space should not be speculated upon; essentially that everybody should have a right to space. The different claims that it makes, the different orientations and directions that it gets taken in, are the result of different legislations that the Convention has to tackle depending on the country the project is taking place in. This is because every single country in Europe, for example, has its own legal codes around housing, although we are all bound by the European Union and some of its protections, there is not one single house code that decides what happens to housing, or who gets a house, or how or why; everything still responds to national legislation. So, in that sense, the Convention needs to be a travelling document that goes to each different European state – for now – in order to rewrite itself according to local legislation. But the founding claim is that occupation should be protected, and that housing, the way it is right now – which is: the more money you have, the better off you are in terms of how much space you have, and what you can afford and where you can afford to live – gets dismantled. The Convention claims for the idea that urban space should be a common, like a kind of communal good. It is not the first document to do that: the Right to the City which was written in Brazil in 2004 tried to do that, and there have been movements before the Convention obviously, who have been working on housing rights for hundreds of years, the Diggers in 16th Century England, are an example of a Protestant radical land right movement. Many indigenous movements have been fighting the idea of an individual right to property for centuries, and significantly, one of the objectives of the IMF and WTO is to in-state private property rights in ‘developing’ nations. The Convention is an addition is some ways, a writing exercise, a para-legal document, that sits with/ through/ by/ this history. You have collaborated with lawyers, activists, migrants, academics, cultural workers, institutions, and so on. What is the role of the participants? To answer this I’ll need to talk a little bit more about the structure form the beginning: so what happens after the initial invitation is that we, or I, go and work with an art institution, I get an x amount of money from them, which is used to pay people to come and speak at the public meetings organized for the convention, as well as research that I do on that host city, other spaces that have been thinking along these lines or people to involve that have been organizing around this question a long time. The Convention tries to work side by side with movements and struggles that have been happening in that specific space, obviously only after having conversations and seeing if there is a mutual need for the conversation to occur. The reason why I try to get financing from art institutions to do it is that by working with an art institution, and not, let’s say, working through a not-for-profit organization, the agenda can shift slightly depending on each new country, and it can remain within the realm of something ‘illegal’, and it means that the agenda can always shift, depending on who takes part. 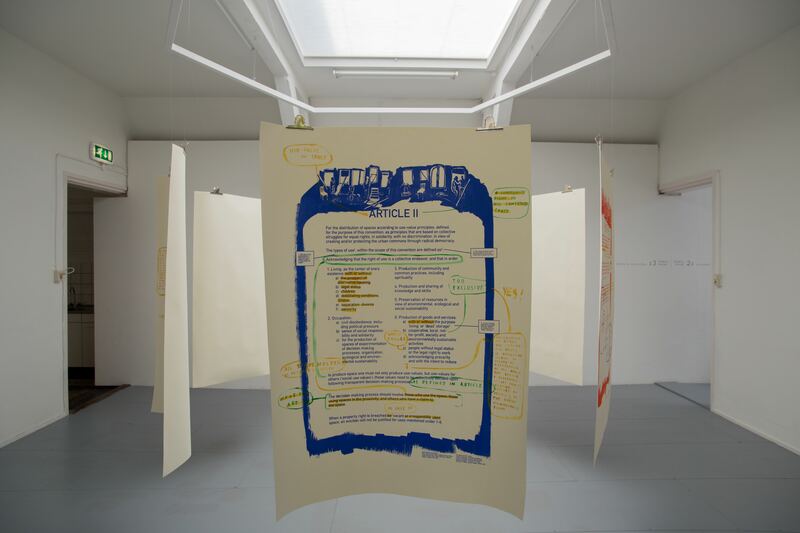 Using the art context to push this project forward means that there can be different stakes, that those stakes can change, and that there no real blueprint for what this document is and how it operates, other than the protection of occupied space. Generally, there are about six to seven meetings, every time we re-write the convention in a different country. The Convention usually has certain themes: we start to look at who the Convention is for? And that might be the agenda for meeting one; meeting two might be how do we define ‘space’ or ‘urban space’? Or should it even be about ‘urban space’? Could it be about space that includes non-urban entities? There might be one meeting on who the Convention serves, one meeting on how to define space, and after we decide whether to limit it to urban or expand it to spaces outside the urban context, there could be one meeting on how to define a sort of use-value to those particular spaces. By use-value, using Marxist theory we mean: is there a space that has a value in and of itself above its exchange value? would a space that – let’s say – has been occupied and had a bar run in it for twenty five years, have a value against the exchange value of the building? who gets to decide what is more important between the market value of the building – which might be two million dollars – or how it has been used, which is priceless or unfit to be judged in monetary terms? Moreover, if that value, a communal value, set in motion by those who use the space adds exchange value (monetary value) to the price tag, how is it possible that those economic benefits are only reaped by the owner, when they decide to get rid of the building? That neighbourhood, that use, that is a communal, lived use-value. And obviously because we live under capitalism, the two million dollars building is only worth two million dollars, and it needs to be sold by the sole owner. What if we want to shift that paradigm and say: well no, that is being used and the use value of the space is way more important, it must be protected because it’s use-value goes beyond the concept of individual property, it must be held in common, it just does not have a monetary value that can be exchanged, it just has use-value shared by many: the inhabitants, their friends and those who use the space. Therefore what would it mean to live under an economy of uses rather an economy of exchange? It’s a revolutionary way of thinking about space in para-legal terms, yet it is also a way of thinking about space that pertains to non-capitalist communities. It’s not new. About the participants: we invite people to come and speak and then we also have a public, there are open meetings, we try to advertise them as much as possible, through channels that are not only geared towards ‘contemporary art’ crowds. Meetings are usually five hours long and people have been invited to speak and present their case, for example, propose which particular question is important in their country, etc. 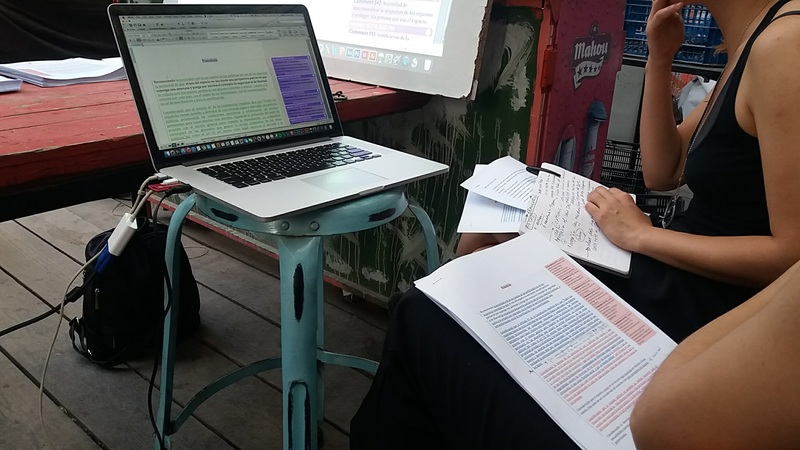 Then the group debate the presentations, and the last step of the meeting is when we actually try to write the legal document live, gathering parts of the debates we had during the meeting. There is always a lawyer present, they’re a figure that accompanies us throughout the project, and so when we are writing the legislation live during the meeting the lawyer is there to make sure we are using legal language that is appropriate. That has also been a struggle because legal language is obviously very specific and professionalized, it is very hard to understand, there have been debates around whether the Convention should not be using that language, but a simplified, pared-down version. The argument for using legal language is that the ‘officiality’ of the document is useful for use in courts. In each iteration, the Convention is revised and adapted to diverse contexts, countries and regulations. How did you deal with these differences? Can we still find common strategies? The Convention started in Holland in 2015, it was initially written and debated in English and then translated Dutch, it was then completely translated once again when it was brought to Spain in 2015. 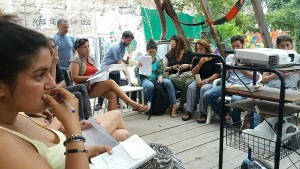 The Spanish translation was completely revised and in part entirely rewritten into a new document always through the same process: research, public meetings, a lawyer present, institutional funding and spaces that supported the project, -spaces that can be both institutional and squatted spaces, or spaces that are outside of the institutional formal networks. How is it different in every context? As I was saying, although, those considered European citizens have rights in common, there is no common rights framework for housing, housing protection, or housing benefits across the board. However there is an EU charter for human rights that does include a ‘right to house peace’, although does not include right to housing, so as European citizens we can use this article, article eight of the European Charter of Human Rights, which states, in short, that once we have a house we have the right to be in there peacefully and not be disturbed i.e. police intervention, unlawful eviction, noise and general disturbance etcetera. That has been used in the past as a way to stop evictions, especially those of squats, and I think there are a couple of cases where it has been held up and used in court successfully. In this sense the Convention sometimes leans on pre-existing legislation as leverage. For example, the Dutch version of the Convention actually uses article eight in the European Charter of Human Rights to validate its claims, as a way of saying ‘hey, we already have some of these protections! They’re just not enforced!’. Yet what about those not considered EU citizens, because they are denied status for example, or who are vulnerable in some way because of their identity, or because they have been swept aside by the housing/ economic crisis and the effects of neo-liberalisation? Alongside claims in the grey-area of legality which can be supported through existing legislation, the Convention also asks for things that are completely illegal, mostly made illegal recently, for example by the criminalization of squatting, which happened in the UK in 2012- just pre Olympics-, and in 2010 in The Netherlands. Prior to that, occupation in Europe was highly tolerated, there were very a few countries that had an actual criminal legislation around occupations, it was a civil matter, and I think it was one of the reasons why the Convention came into being right at that time, to fight the criminalization which had just come into being. Instead of paying a fine, now you risk jail time both in the Netherlands and in the UK. I was interested in producing a document that at least brought attention to the question, a document that could be a sort of writing exercise in legislation and legislation building. At the very least it could try to produce a different imaginary around what and how law can be written, at best it could be supported into actual law, or used in court. Of course, it is complex to do this through an invented para-legal system, so outside the normative ways in which laws are written, which is obviously through parliament etc. Going back to the common strategy part of the question: the Convention can be a tool for common strategies in some ways because in the future the hope is that it will become a ‘European Convention on the Use of Space’. Once as many countries as possible have been involved in the writing of its different versions, in different languages, according to the different parts of legislation across Europe, the idea is to bring everybody together to write a final cross-language document. I have no idea what it is going to look like. To give you a taste: the Dutch version included a lot of references to Dutch legislation, the Spanish version includes almost none to Spanish legislation although it includes a brief history of the neoliberal overtaking of the Spanish housing market. The Spanish Convention is entirely written in the feminine form, which was a request of one of the groups that we worked with, Somateca, a queer rights collective. There are different collectives that comment, operate and help us and obviously this influence the Convention hugely. One of the last activations happened in London. What are the particular aspects of the Convention there? The Convention has many different strategies that allow for it to be sort of active in periods where it is not being entirely rewritten as a project. Between the Dutch version and the Spanish version that is currently being finalized we did do a ‘read-in’ in London, at a space called Tenderpixel in Spring 2016. Although I did not bring the project to London in its entirety the ‘read-in’ allowed a group of people who came to the meeting and were interested in the project, to read and take notes in preparation for hopefully doing a UK version of the Convention itself. The ‘read-in’, as it is called, is a strategy to keep attention on the Convention alive to some degree. The readings are also very useful because they produce publics around what the Convention is and how it works. This is a question that I get a lot. The Convention works on many different levels; on the one hand, it is an experiment in writing. The Convention is used every time we have a meeting to sit down and activate conversations around how to write law, why the law is written, what the law does to the body, how law regulates. Of course, we do not have – and maybe we do not want – the capacity to enforce the Convention, which is a regulatory function of actual law. The State has the police, the military and all these organs to enforce its laws, while a para-legal systems such as this one, does not have a way to do that. Therefore the only ways in which it is useful is through voluntary implementation, and through implication in some ways. The more people implicated in it, either as part of the meetings, or as signees, or as people who support the Convention in one form or another, or use it in court as a supporting document, the more that happens, the more we have a capacity for movement building around what the Convention wants to say, do, and means. I think in terms of how it can be used: as a supportive document as I said, and as a document that becomes a sort of exercise in empowerment in some ways. Hopefully in different ways too, that we have not discovered yet. So far, what are the results or consequences of the project? So far, not huge consequences. It is something that gets hotly debated during the meetings. But how can you test the functionality of a work of art? I remember in college, wondering about the perceived significance or urgency of something like Brecht’s theatre at the time of its existence and a fellow student responding: well, Brecht did not really know what kind of response he was going to get, specifically or precisely when he was writing ‘The Threepenny Opera’. Then obviously what Brecht wrote, had an immense impact on Western culture. Thus I feel like it is a hard question to answer. The Convention has a utility, it has a function, it has a capacity, and that capacity needs to be constantly activated and kept alive, so I don’t have a great answer to that just yet. What it has done so far is create some really interesting debates around legislation, it has been signed by hundreds of people, it is a poster that hangs in different housing cooperatives and different spaces across Europe. It has not had a humongous legal impact at the moment, although it has entered the imaginary of the many hundreds of people who took part in the meetings across the past few years. But then again, it is probably a ten to fifteen year project and we are in year two, so let’s give it some time. How do you see the future of the project? It is a hugely taxing project both emotionally and work-wise because I have to spend maybe four months a year working on it, meeting with different activist groups, jurists and lawyers, working in depth on these kind of questions; and how people are specifically affected by these kinds of laws, so it is a huge amount of research. My initial plan was to do one version of the Convention a year and obviously, that seems to be incredibly difficult endeavour for one person. What I am hoping to do now is to write a protocol out and be able to let the project run a little bit more freely, a task that can be taken on by different groups, for example groups of students at a law school. There are also huge questions around the notion of Europe, especially now, but at least it designates a sort of functional border, a limit to the project’s reach. We live in a world of borders, they exist, different laws regulate bodies within them and to write a para-legal document we have to keep this in mind. I guess the idea is to keep writing versions of the Convention and eventually get to the European Convention, and at that point decide on the future implementation of the project: how do we implement it legally? I think that’s a really long process. Adelita Husni-Bey (Italy-1985) lives in New York. She stages workshops and produces publications, radio broadcasts, archives and exhibitions focused on using collectivist and non-competitive pedagogical models within the framework of urban studies. In her 10 years practicing as both an artist and a pedagogue Adelita has worked with activists, architects, jurists, schoolchildren, spoken word poets, students and teachers on unpacking the complexity of collectivity. To make good what can never be made good: what we owe each other. Recent solo exhibitions include: Four Films curated by Lucia Pietroiusti for Serpentine Cinema, 2017, A Wave in the Well, Sursock Museum, Beirut, 2016, Movement Break, Kadist foundation, 2015, Playing Truant, Gasworks, 2012. She has participated in the Italian Pavillion, 57th Venice Biennale curated by Cecilia Alemani, 2017, The Eighth Climate, 11th Gwangju Biennale, 2016, Ennesima, Triennale di Milano, 2015, Undiscovered Worlds, the High Line, 2015, Really Useful Knowledge, Reina Sofia museum, 2014, Utopia for Sale?, MAXXI museum, 2014 and has held workshops and lectures at ESAD Grenoble, 2016, The New School, 2015, Sandberg Institute, 2015, Museo del 900, 2013, Temple University, 2013, Birkbeck University, 2011 amongst other spaces. She is a 2012 Whitney Independent Study Program fellow and is currently working on a film interrogating secondary trauma with immigration lawyers in the U.S.